I am having trouble with Screen Recorder. I can launch and it records my pc screen with no problem. But if I am capturing a video that plays on the screen, then the resulting output is choppy during playback of the screen recording. "Jerky" and "stutters" would be other ways to describe. Sometimes the screen recording just gets stuck at a point, but mostly it just stutters its way through the entire video. Dell laptop XPS15 running Windows 10 Home 64 bit. Details in the attached DxDiag log. I have used 2 different versions of Screen Recorder - SR16 that was included in my purchase of Director Suite 6 and also SR 4.0.0.6785 that I downloaded as a trial to see if maybe SR16 has a problem. Both programs produce the same choppy videos. Further, I am able to successfully do a screen recording with OBS Studio with no choppiness. The OBS output looks just like the original video. I would like to get this resolved because Screen Recorder is integrated with Power Director and it will greatly simplify screen recordings that I would like to make and then edit with PD. I could just record with OBS and then import into PowerDirector but I would really just like to use all Cyberlink products. I have also attempted a screen recording by starting in PD, selecting the Capture tab and then selecting the Capture from Screen function. Same results of a choppy video. If you can capture properly on the 4k (3840 x 2160) resolution with OBS then do so as the Screen recorder can only capture at 1920 x 1080 resolution. The cpu and gpu in this laptop may not be good enough to capture with hardware acceleration. Remove that in the screen recorder preferences and try again. It should work much better. Something you should try first is updating all of the drivers on your laptop. Both of your Intel and nVidia GPU drivers are a year+ out of date, and there are many other items that should be updated, including the BIOS. Please visit this Dell page and download and install at least those 3 items, then try ScreenRecorder again. Depending on your tech comfort level, you may want to use the Dell Delivery Application to automatically scan your laptop and suggest the appropriate updates to install. Quote If you can capture properly on the 4k (3840 x 2160) resolution with OBS then do so as the Screen recorder can only capture at 1920 x 1080 resolution. The cpu and gpu in this laptop may not be good enough to capture with hardware acceleration. Remove that in the screen recorder preferences and try again. It should work much better. Thanks, I'm quickly coming to a conclusion about using OBS as you suggest but I need to first update my system and drivers as optodata has suggested. Unfortunately, since I updated the Bios, OBS is now choppy, albeit not as bad as Screen Recorder. So seems that drivers may be my issue. SR16 and SR4 do not seem to have hardware acceleration, or at least I can't find it. Under Performance Settings in SR16 there is a setting named Intel Quick Sync Video. I've tried recording with this both on and off with the same results. 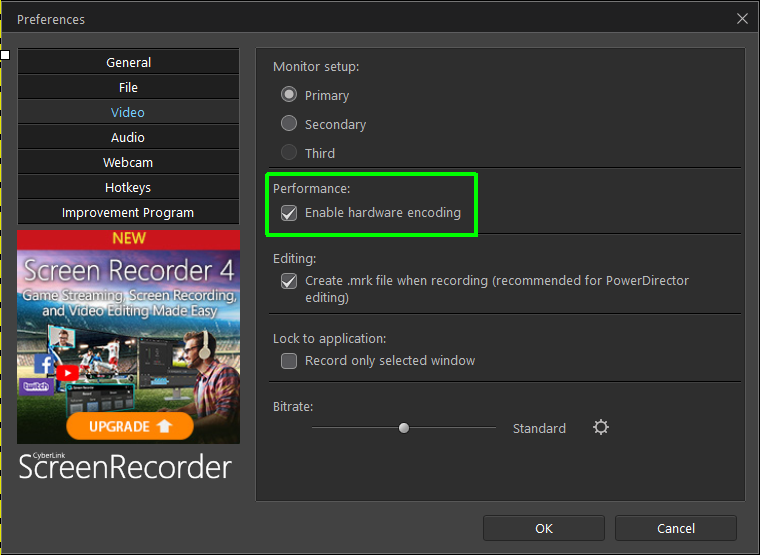 Under Performance in SR4 is a setting named Enable Hardware Encoding. I have also tried recording with this setting both on and off, again with the same choppy results. Appreciate your help. Now I've got to sort through the driver issues. Quote Something you should try first is updating all of the drivers on your laptop. Your post has helped me to discover a broader problem I have with my PC. Dell updates have not been happening. I was surprised to find that I didn't have the latest BIOS for example. So as you suggested, I need to resolve this first before I deal with Screen Recorder. Interestingly, after updating the BIOS, OBS now produces choppy videos, albeit not as bad as Screen Recorder. So it seems that the drivers may indeed be the problem. Unfortunately, updating the GPU drivers is not straightforward because both Intel and Nvidia are in the beginnings of driver type changes and Dell has not caught up. But that is not a problem for this forum, so I'll report back after I get my system up-to-date. Thank you for the help! The problem with Dell machines is that they make it hard to use the latest video drivers from nVidia and Intel, so the best choice for most people is to use Dell's versions. In your case, the nVidia and Intel drivers from the website are still outdated, but they're newer than what you originally had installed.